It uses the same advanced microwave detector as the Acoustimeter. The Acousticom 2 was designed using the experience gained from many years of practical RF and microwave measurements. 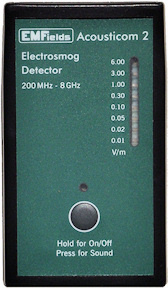 The advanced RF detector is the same as that used in the Acoustimeter. LED lights display the peak levels of microwave electromagnetic fields from 200 MHz up to over 8000 MHz (8 GHz), covering the frequencies used by most modern communication systems encountered in our everyday environment. This includes TETRA, all mobile phone systems including 4G/LTE, Smart Meters, and all WiFi and WiMax frequencies. The LEDs update rapidly, and allow you to quickly gauge the levels in an area and find any hot-spots. Its readout is sensitive to 0.01 V/m.